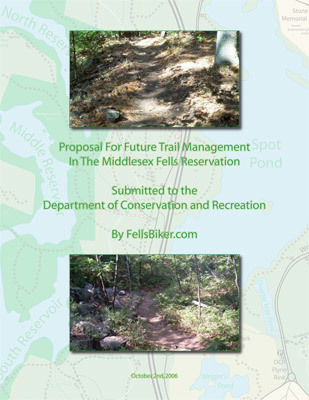 Middlesex Fells Reservation : The "FellsBiker Proposal"
In the Fells, every group has it's own opinion on how the DCR should run things. NEMBA wants bikes to have a little more access. The Friends of the Fells want bikes to have a lot less access. What I, the creator of FellsBiker want, is to solve the problem at its core. I want the DCR to stop treating the two user groups of Mountain Bikers and Hikers/Runners differently. There have been countless scientific studies that all concluded there is little or no difference in the trail impact between hikers and bikers. I am calling for equality on the trails. I wrote out a brief plan of how I think the trail system in the Fells should be managed & maintained going forward. I personally handed it to the DCR's Fells District Manager. (He then got arrested and thrown in jail) My hope is that all of the different groups can start working together toward the common goal of improving the trail system, changing it from a good trail system to a great trail system. If you want to write a letter to the DCR, expressing your dissatifaction with current situation in the Fells, and your support for this proposal, you are encouraged to do so. Please put the address to this proposal [ http://www.fellsbiker.com/proposal ] in your letter so people that read your letter can look up the proposal and know what we are talking about.